Follow the route of emperors, kings and queens on a magnificent European journey along three rivers and through five fascinating countries. 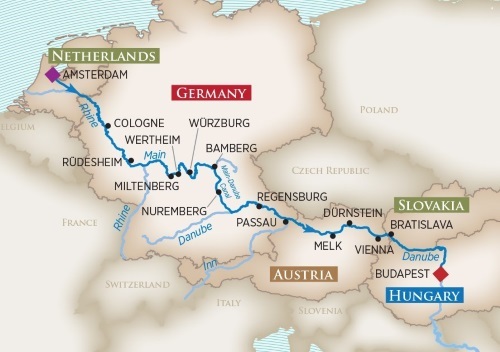 The natural wonders of the Danube, Main and Rhine rivers yield way to countless UNESCO World Heritage Sites: Cologne’s Gothic Cathedral, the Würzburg Residenz Palace, the charming Old Towns of Bamberg and Regensburg, and the Melk Abbey—to name a few. Whimsical delights from Siegfried’s Mechanical Music Museum in Rüdesheim to the crooked houses in Miltenberg, will enchant. Connoisseurs of fine wines get to taste the difference between German and Austrian Rieslings; and gourmets get to indulge in Western and Eastern European specialties. And for active enthusiasts, you will get to hike and bike through breathtaking scenery in Passau, Dürnstein and Vienna. All of this and more awaits on one all-encompassing magnificent journey. Port Charges: $364 per person.